I have a reputation for ranting about things that bug me. Venting one's frustrations is of the benefits of having a blog. I've previously written pet peeves posts as they relate to movies, and for common mistakes in the English language. I recently remembered another one that has to do with social etiquette while eating with others that really gets me chapped. There is a scene in Mystery Men where the 3 wannabe crime fighters are eating dinner together. They get the bill and divide it 3 ways. Hank Azaria (The Blue Raja) is frustrated by this and says " Whenever we split the bill, the steak eater picks the pocket of the salad eater." I am sometimes reminded of this scenario in real life when people go in on a pizza or some other food and someone hogs more than their share. What makes this situation even worse is when the person going to town on the pizza starts discarding large crust pieces. Is the pizza crust really that disgusting, or are they just too busy eating the expensive part of the pizza and can't be bothered by finishing what they have? 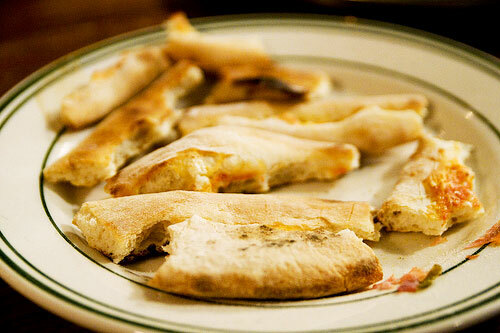 Pizza crust is not like chicken bones or peanut shells which were intended to be thrown away. If you are buying your own pizza, go ahead and eat the pepperonis off it and feel free to throw the rest of the piece away. Do whatever you feel like, but if you are going in on pizza with friends, or at a party eating someone else's food, don't take a second piece until you finish your first! It's a sad day when we have to ration the pizza out in equal portions as soon as it arrives in order to protect ourselves from predatory eaters. If you are guilty of discarding half eaten pieces of pizza, you might want to be careful next time you are at a party because you are being watched and you are outnumbered. Anyway, besides that things are going pretty good. Have a great Memorial Day. I have a love/hate relationship with YouTube. It can be a waste of time, but it is also a great way to learn about things. I would have to rank it up there with Wikipedia as once of my favorite resources. Unfortunately, most of my research topics include pranks, wipe outs, doing cruel things to drunken or sleeping room mates, and science projects with Mentos and Coke. Despite these shallow topics, there is still a lot of good information too. When I hear about something that happened on TV or in the news, I can just look it up on YouTube to get the scoop without having to watch TV. This has been especially helpful for sports. I love watching the NBA top 10 plays every evening. The other day my 6 year old was asking me how paper is made. I just typed in "How is paper made" and we watched a video for a few minutes that showed us how. I was glad he asked me because I am too old to be asking that question, but I have always wanted to know for myself. My kids can't believe how old fashioned encyclopedias are and wouldn't imagine using one if they could just look something up on the Internet. When I tell them how I used to use encyclopedias to copy my reports do learn about topics and research things, they just look at me in disbelief as if I'm telling them a "walk 10 miles to school in the snow" story. YouTube is also great for looking up vintage TV shows like Dukes of Hazzard, Fantasy Island, Shazam, and The Incredible Hulk, although my kids are yet to be impressed with any of the shows that I watched as a kid. I keep sensing a familiar trend of being disrespected by the younger generation. YouTube has it's disadvantages too. Sometimes you don't get what you expect when people mislead the content of their video with a bogus title. I also tire of seeing the same featured faces of people who have daily video blogs on YouTube. My biggest pet peeve is clicking on a sports highlight or a title that sounds interesting and then finding out it is a actually a video game clip. On a future post I think I will share some of my all time favorite clips. When I was 14, I started keeping track of my height, weight, and measurements as I grew. I'm a detail person, so I've kept a record of these stats annually for over 25 years. It has not been fun to see the numbers slump as I get older, but I still do it. I used to worry about what my ideal proportions or measurements should be. Obviously there are many variables to consider, such as height, frame size, age, and genetics. People are not as simple as diamonds, which can be cut to ideal proportions. When people hear the words "Grecian Formula", they usually think of hair oil, but there is another Grecian formula or ideal; a set of proportions for the "ideal physique." Body builders try to achieve the perfect balance of size and symmetry. Some of them calculate this by using their wrist circumference, which in turn determines what their other measurements should be. For a person who is 6' 2" like myself with 7 inch wrists, the software says my ideal measurements should be a 46" chest, 17" biceps, 32" waist, 24 " thighs, and 16" calves. Apparently my body measurements are NOT ideal. The Greek sculptors would be ashamed of me, but I don't think I'm alone. The average man in the US is 5 ft. 9 and weighs 190 lbs. and doesn't fit that ideal either. The average American woman is 5' 4" and weighs 150 lbs. Compare that with the average female model who is 5 ft. 10, weighs between 110-120 lbs. and has measurements of 34-24-34. If you think those are tough measurements to live up to, check out the Barbie doll. If she were life size, her measurements would be 39-18-33. Don't feel picked on if you are a girl. These impossible expectations carry over to boys too. The average action figure is apparently on steroids with proportions that would make Mr. Olympia jealous. No wonder so many people have eating disorders and body image issues. My point is that not everyone can look like Arnold Schwarzenegger or (insert celebrity). Maybe you are big boned and will never have a frame like Angelina Jolie. You shouldn't stress out about this because, odds are, your husband doesn't look like Brad Pitt either. Measure your success against yourself not a model or celebrity who's body represents less than 1% of the population. If they are famous for their physique, then staying in amazing shape is probably their full time job. Remember that the model in the picture you may want to look like has genetics, extensive photo shoots, cosmetic surgery, and airbrushing on their side. Don't think this is a sour grapes post, or that I'm implying it's not important to get into shape. I'm not trying to talk anyone out of reaching for their fitness goals or getting into the shape they have always dreamed of. I'm just saying to be realistic about it. I believe that everyone can improve their own physique and make progress from where ever they currently are. If a picture of someone motivates you to get in better shape, then that's fine, but don't let society tell you what you should look like. As you adopt a healthy lifestyle, you can get into great shape, and if you work hard enough, you can eventually reach your personal physical potential. For more health and fitness posts, see my other blog at www.yourfitnessquest.com. Most people may not relate to this post, but I sometimes get stressed out just from the potential or "what if" factor of certain scenarios. Sometimes at night I hear water pipes hissing when our water softener is working and it might as well be the sound of someone breaking into my home. 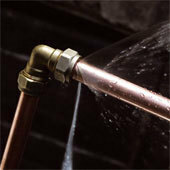 I am not paranoid and neurotic about water leaks naturally. I have been conditioned by past traumatic water leaking experiences. Sometimes at night I imagine all the built up water pressure that is just dying to get out and it stresses me out and makes it difficult to sleep. I know that the many valves and pipes throughout my home holding the water back can't take the pressure forever and are bound to give in some day. I'm aware that this is not a logical response to such a beautiful things as indoor plumbing. If I used that same train of thought, then I should probably be scared to go out in public where there are lots of people. It's not that I am scared of people. I just don't like blood and I get grossed out watching stuff like surgeries on TV. At some point, there is bound to be some blood leaking. Just think of the nasty potential if everyone at a party sprung a leak at the same time and started bleeding all over. I have never had a good relationship with water. As I've mentioned before, it is one of my greatest fears. I've heard of people who are scared of spiders, confined spaces, heights, going out in public, etc. but what would it make me if I'm scared of leaking water in my home? I'm sure there is a name for it, but I'm too lazy to find out. Maybe someone reading this could enlighten me. Just don't try any Freudian psychoanalysis on me. I feel dumb enough stressing over the potential water damage in my home and the last thing I need to find out is that I have even deeper issues like bed wetting. I know it's photo shopped, but it's still funny. I hesitate to address this topic since politics is often a forbidden subject. It can be a challenge to say anything about politics without offending people (unless you are a gifted politician who can speak out of both sides of your mouth), but I'd still like to share some of my thoughts about this topic. I understand there is quite a spectrum of beliefs and values when it comes to politics, but here are some sweeping stereoptypical generalizations that the two largest parties often accuse each other of. Those with a more liberal agenda are often labeled as being tree hugging, Godless, tax happy, abortion loving, welfare dependent, big government socialists. Likewise, Conservatives are accused of being rich, money grubbing corrupt capitalists, warmongers, holier than thou, simple minded, gun carrying, uneducated hicks. These are extreme depictions of the major parties, and although some people might think these descriptions are accurate, most people share many of the values taught by both parties and fall somewhere in-between. I think we are all more alike than we know, but just have different ways of trying to achieve our objectives. Anyway, I wish we lived in a world with very little taxation, yet with social programs people could participate in if they wanted to. People could have security from crime, hunger, and poverty while at the same others could have the freedom to follow their dreams and take risks with little government interference. I'd also make chocolate milk and Toblerones very affordable so they could be the staple of every meal. I'm not joking. I hate the divisive nature of politics but I'm grateful to live in a country that allows people the freedom to voice their opinion and follow their conscience. 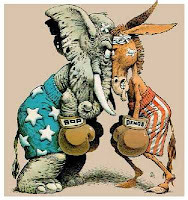 I just wish people could get along better and when they disagree with each other, it would be nice to see more civility. 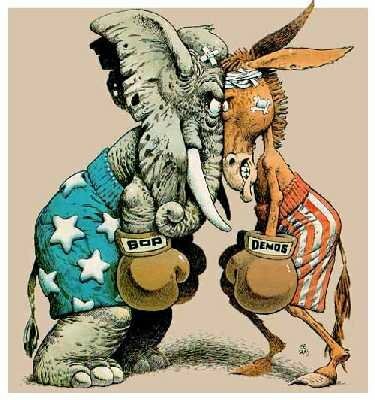 I appreciate it when people use diplomacy, tact, and respect in the political process, even if I totally disagree with their politics. When I was a kid, sometimes when I'd watch news, a lady in a small oval would appear in the lower corner and sign for the deaf viewers. I used to think that was distracting, but these days things are getting ridiculous. Today if you watch a news cast, there are stock prices streaming across the bottom of the screen. These are interupted with developing news story flashes and sports scores. Then you have special effects sounds and fancy visuals flashing on the screen between stories. If that wasn't bad enough, many news programs and shows today do their broadcast with people walking by in the back ground. These people frequently stop and stare and waive to the camera. Some people are drawn to a camera and instinctively act foolish much like a moth is drawn to the light. I guess the real blame for that kind of activity lies with the news program director. Why would they want to permit the attention seeker factor to interfere with their broadcast? Can you imagine if they filmed 60 Minutes on a busy street behind a glass window? I can imagine people making blowfish on the glass and flexing behind Ed Bradley the whole time. Just once, I'd like to see someone sneak up behind these people as they are dancing or waiving for attention and zap them with a taser while they are showing off. That would be an entertaining news broadcast! These obnoxious attention seekers remind me of a skit Jim Carey used to do on In Living Color. Humor can be a subjective thing. Some people enjoy blatant slapstick stuff like slipping on a banana peel, but I have never really warmed up to that kind of comedy. I prefer a more subtle and cerebral approach. Many times over the years I have imagined scenarios that I think would be funny. Usually when I share these ideas with coworkers they respond with a hesitant courtesy laugh or a nervous look. I know my humor is not the typical knock knock joke type of humor and as a result many people don't appreciate it. Here are three examples. 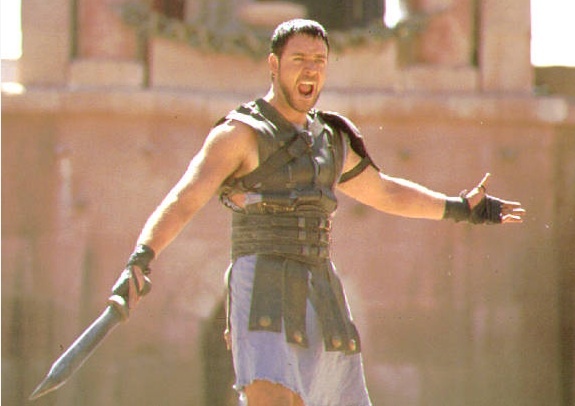 I love to play basketball and I think it would be funny if on a particular day if I was playing well and made a game winning shot if I took the ball and hurled it at the spectators and yelled "Are you not entertained?" and walked off in disgust like the scene in Gladiator. I'd like to write a screen play about a guy who takes frequent bathroom breaks at work. For years his co-workers were under the assumption that he had irritable bowel syndrome or some kind of digestive disorder so they are cool with the excessive breaks he takes throughout the day. Once day a co-worker is in the bathroom and the toilet won't flush so he lifts off the tank lid to see if the chain broke. He discovers zip lock plastic bags full of treats and a game boy. Just as he pieces things together he turns around and sees his co-worker standing behind him as the violin music from Psycho starts. I work in the insurance industry and often do replacement cost estimators for homes. When insuring a home I ask clients questions about sqaure footage, construction materials, type of flooring, etc. I think it would be funny to also ask if the applicant has a DVD collection and when they say yes I would ask in an official voice if they have Harry and the Hendersons on DVD. I would then proceed to ask if they owned Footloose or any other John Lithgow movies. I would continue this process until they asked me what that had to do with anything. Unfortunately, from past experience,there are some clients who I could ask movie questions to for half an hour before they would get suspicious. I guess you'd have to be there. Like beauty, humor is also in the eye of the beholder.